This wig is treated with NOW by Sherri Shepherd Keralon™ Plus, their exclusive Keratin coating that leaves hair soft, silky and beautiful. STYLING TOOLS SHOULD NOT EXCEED 320º F. SHERRI SHEPHERD WIG. Hair spray can also be used. The FUTURA synthetic fiber can be styled, heated (up to 340° F), set in curlers and flat irons. Color in the Pictures: Different monitors display colors differently, the color of the wig will also display differently due to the light setting. Gorgeous Layered Yaki Straight Lace Front Wig. Texture: Yaki Straight. The wig is synthetic, but it is a yaki texture and looks very realistic. It is also very soft to the touch. It can be styled in various ways and has long bangs and a side part. Best Ombre Light Blonde Lace Wig Long Straight Synthetic Wigs Heat Resistant 22"
Lace Wig Type: Synthetic Hair Lace Front Wigs With Elastic Bands&Combs Material: High Quality Heat Resistant Synthetic Hair (UPTO 150C) Picture Color : Ombre Light Blonde Texture: Straight Length: 22" Cap Size: Medium size cap. Hair Material : 100% Heat Resistant Synthetic Fibers. Hair Texture :Synthetic. Hair Length : Long. Hair Quality :;No Tangled, No Shedding, Very Soft as Nautral Looking. Lace Wigs Type: Ombre Long Wavy Synthetic Lace Front Wigs For Women Material: High Quality Heat Resistant Synthetic Hair (UPTO 150C) Picture Color : Ombre Black to Dark Brown Texture: Natural Wavy Length: 24 Inch Cap Size: Medium Size Cap (22.5 Inch Circumference). Straight Synthetic Wigs Ombre Purple Wigs for White Women. Hair spray can also be used. The FUTURA synthetic fiber can be styled, heated (up to 340° F), set in curlers and flat irons. The LF Diamond Heat Resistant Synthetic Lace Front Wig is a hand tied lace front wig with a long straight style, soft smooth texture and a undetectable hair line. Feature: pretty looking and the wig looks natural and fashion. This wig is made of Heat-resisting fiber which can resist high temperature.It. Brush the wig gently. Don't try to get every hair perfectly in place. Once finished with the combing, hang the wig or place it on a wig stand and allow the wig to dry naturally. This Wig is Long Straight lace Front style. This relaxed, yet voluminously chic look never goes out of style! The hair has a lot of body, can be styled in many ways and has a part in the middle. Wigs are not indestructible and should be cared for properly to extend the wear/use. Wigs in general do have a tendency to shed. Ombre Light Blue Lace Front Wigs Long Straight Heat Resistant Synthetic Hair Wig. Lace Wig Type: Synthetic Hair Lace Front Wigs With Elastic Bands And 3 Combs Material: High Quality Synthetic Wigs Heat Friendly (UPTO 150C) Color : White Blonde Texture: Straight Length: 24 Inches Cap Size: Medium Size Cap (22.5 Inches Circumference). OccassionBlue Ombre Wig For Party, Cosplay. Straight Synthetic Hair Light Blue Ombre Lace Front Wig Heat Safe 22". Picture Color : Ombre Light Blue (Two Tone ). Synthetic WigBlue Straight Synthetic Lace Wig. Synthetic Hair Lace Front Wigs Heat Safe Long Blonde Straight Wig 24". ColorLight Blonde. 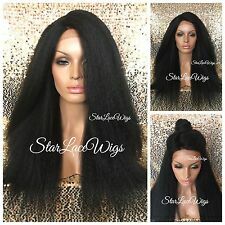 Lace Wig Type : Synthetic Lace Front Wigs With Elastic Bands And Combs. OccassionBlonde Straight Wig For Party, Cosplay. We are a wig factory!!! Material: high quality synthetic & high-temperature resistance fibers. headgear with adjustable button match all head styles. length: (as below). You may also like. color: (as below). K'ryssma Synthetic Lace Front Wigs Ombre Black Roots to Blue Long Straight Middle Parting Glueless Synthetic Wigs for Black Women Heat Resistant for Cosplay 20 Inch. Ombre Green Synthetic Lace Front Wig Long Straight Wigs Heat Good 24 Inch Item Description: Lace Wig Type: Ombre Synthetic Lace Front Long Straight Wigs For Women Material: High Quality Heat Resistant Wigs Synthetic Hair (UPTO 150C) Picture Color : Ombre Dark Roots To Green Texture: Straight Length: 24 Inch Cap Size: Medium Size Cap (22.5 Inches Circumference). Long Straight Synthetic Wigs Ombre Purple Wigs for White Women.